The occasional itch—be it a bug bite or rash—is annoying. But there are millions of people with chronic itching conditions, like eczema and psoriasis, who are constantly scratching their skin. This is more than a little irritation—it drastically reduces their quality of life and is a perpetual distraction. Current anti-itch treatments include topical corticosteroid creams, oral antihistamines, and various lotions. But researchers at NIH have gone beyond the skin’s surface and discovered a critical molecule at the root of that itchy feeling . Until now, it’s been unclear how the sensation of itching was carried to the brain. Was this a separate system, or did it use the same nerve pathways as pain, touch, or temperature? To find out, the researchers focused on a special group of nerve cells called “TRPV1 neurons,” which extend to the skin and detect temperature, various types of pain, and itch. These neurons use several chemicals to transmit signals; one of those is a neurotransmitter called Nppb. When the researchers created mice lacking Nppb, the mice became immune to itching. Even when the researchers exposed the mice to several itchy substances, such as histamine, the mice refused to scratch! When the researchers actually removed specific spinal cord nerves that receive the Nppb itch signals, other sensations—like pain, touch, and temperature—remained intact. So we now know that in mice, and possibly in humans, there are specific nerve cells and brain circuitry that are entirely devoted to that itchy feeling. That means blocking Nppb could turn out to be a safe and effective strategy to cure itching, especially in chronic cases. 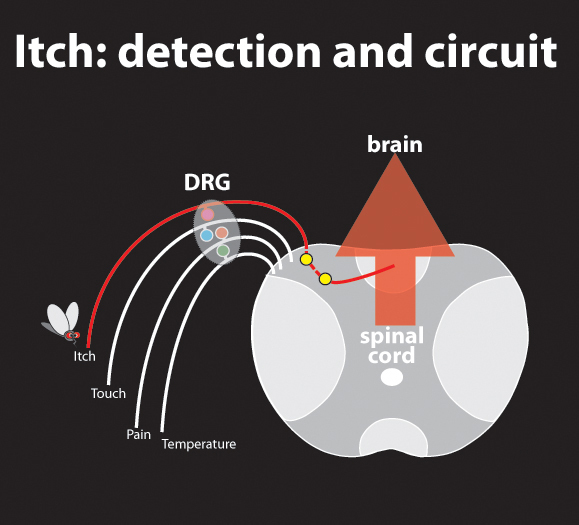 The cells and circuitry for itch responses in mice. Mishra SK, Hoon MA. Science. 2013 May 24;340(6135):968-71. 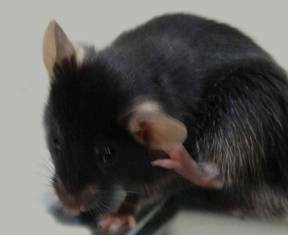 In our experiments on laboratory mice we could block itch by simple chemical interventions. The key molecule that we discovered in our work, Nppb, also has a major role in controlling blood pressure. Thus although it is tempting to speculate that blocking it would alleviate itch, it might have side-effect that are dangerous. Therefore we think this is the beginning of seeing if Nppb or other molecules will be safe and effective for treating chronic itch in people. Getting rid of the itch is great. Patients with CTCL (cutneous t-cell lymphoma) with severe itching can also have redness, rash, plaques, flaking, etc.. If the itch was stopped, would the inflammation also be stopped in ctcl patients? is able to produce such knowledge of the body! I will have eczema all my life until the day I die. I will do anything to stop the itch, if it works great! That will mean no more creams etc. no more coal tar! To live a day, a minute without itching means for me that I can have a real life again! Until then, I will keep hope in my heart, and mind, and prayer too. Very interesting study. I’m very interested in health research and love reading studies like these. Finally, there is some hope to come!